Bonner Springs – Page 278 – Welcome to Wyandotte Daily! 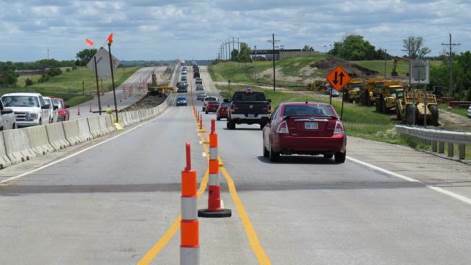 The northbound and southbound K-7, from south of Kansas Avenue to north of Riverview Avenue, will be shifted and placed one lane each direction, side by side, onto the existing southbound lanes on Thursday, June 12. 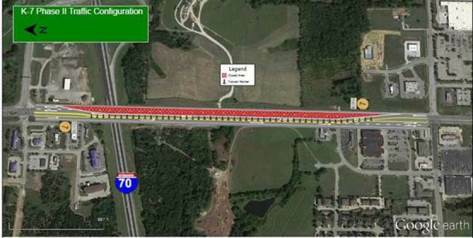 The northbound lanes will be reconstructed during a construction period lasting through late August 2014, weather permitting, according to the Kansas Department of Transportation. The construction will start after the morning rush hour on June 12. The I-70 to southbound K-7 double left-turn lane movement will remain reduced to one open left-turn lane throughout the project duration. Once the northbound lanes are finished, traffic will then be shifted onto the new northbound lanes while the southbound lanes are reconstructed. This construction work is part of Phase 1 of the K-7 and I-70 Interchange Project in Wyandotte County. Traffic will be directed through the project work zone via signage and cones. There will be a 50 mph posted speed limit and 12-foot lane width restriction through the project work zone throughout the project duration. Drivers should expect major delays during peak commutes and should allow extra time for their daily commutes. Clarkson Construction is the project contractor on this $18 million construction Phase 1 project. This portion of the project work is scheduled to be completed in late fall 2014. Sarah McCoy, a junior in technology management from Kansas City, Kan., has been inducted into the Pinnacle Honor Society at Kansas State University, Manhattan. Pinnacle Honor Society members include nontraditional students such as working parents, mid-life adults, and distance students. To be eligible to join the university’s chapter of Pinnacle, students must achieve a GPA of 3.0 or higher, be of junior or senior standing, and have demonstrated a record of excellence in leadership, scholarship and community service. Two area students have graduated from Graceland University, Lamoni, Iowa. They include Darius Dickerson, Kansas City, Kan., Bachelor of Arts; and Amy Schmidt, Bonner Springs, Master of Science in Nursing. Graduation for 500 students was held May 18.